Tonight I went to the website of local talk show host and vegan extraordinare Louie Free, whose studios were recently moved from the "double-wide on the east side" to a space downtown in the old Phar-Mor Building, now named 20 Federal Place. The new studio faces federal street, allowing the public to look onto Louie and his guests throughout the week. Lisa Simpson: Oh, the earth is the best! That's why I'm a vegetarian. 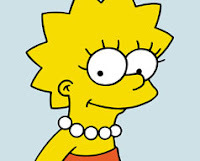 Lisa Simpson, well, I was thinking of going vegan. The lineup for Monday's show looked interesting, with interviews with Bernard Marinelli, owner of the Core nightclub downtown; Betram de Souza, lead editorial writer for the Vindicator; and Father Ed Noga, pastor of the beautiful St. Patrick's Catholic Church on the southside. The first interview featured Mr. Marinelli speaking primarily on the status of entertainment downtown, how erroneous perceptions of the city affect his business interests, and the necessity for additional effort from city officials to engage and assist downtown business owners. These downtown business owners, are in effect like frontiersmen, the first to see opportunity in a difficult environment as they attempt to make their roots more permanent. - When I pick up a ticket from the Chevy Center, usually there is an advertisement for gettix.net or something like that, but why can't there be things on the back of the ticket like coupons for downtown drink specials, reduced cover charges, and general advertisements for the various downtown businesses? Develop further cross-promotional activities. - Hire an additional person within the Department of Economic Development that has existing ties and experience promoting to the sub 35 years of age demographic. Sometime you need youth to speak to the youth. - Explore new ideas, like ipod dj nights, on certain nights of the week. - Before the time when a cover is charged, have lessons in topics such as breakdancing and salsa dancing. I wanna learn how to do a ninja freeze. - Encourage musicians to hang out downtown, perhaps with financial incentives, to encourage street life and pull people from the Chevy Center. Soon afterwards, one caller made an interesting statement about how successive generations of local people have rejected the downtown. His astute comment was that due to their remembrance of the downtown as a thriving place filled with theaters, mass transit, and restaurants in the 50s and 60s, watching its deep slide from the 70s through the 90s has left a permanent mark on the minds of those generations. To me it was interesting because many people I know frame the current re-development of the downtown in a generational context, in that it takes some generations to die or move away in order for progressive generations to push forward. I don't really support this view, nor do I want to support this view. Maybe I believe that an older dog has value, and it can additionally learn new tricks. The generational comment is fascinating though, as I grew up in the generation that never experienced the glory days, never rode on the Wildcat at Idora Park, never went shopping in the Uptown, and never saw miles upon miles of steel mills belch their smoke into the air. I was a teenager in the mid/late 90s when the ONLY places to go downtown were Cedar's and the Draught House, and that's where we hung out. The rest of the downtown was like an empty playground for us to explore, with all the equipment still there but nobody enjoying it. And within the last three years, there has been great improvement downtown, but there is still much to do. The simple fact is, for our generation, the current state of downtown is the best we have ever seen it. But due to experiencing other cities in our country and around the world, we see its potential on what it could be - not what it once was. Issues such as social inequity across the region, the analogy of the mahoning valley as one house with many rooms, the fears of annexation based on lack of information and unwillingness to come to the table, the need for an emerging african-american middle class in the region, uniting across different faiths for community activism, joint economic development districts, cutbacks in regional bus service, media stations partnering together to sponsor downtown events, challenges for the inner-city school district, expansion of the metro library system, the italian fest coming back downtown, redefining old institutions, getting workers to stay downtown after 5pm, and the success of zero tolerance. lots of stuff . . . lots of stuff to chew on. Speaking of chewing, at one point louie expressed his frustration with not knowing what communion tastes like. Here's the Shout Youngstown suggestion: when christmas comes around louie, order some oplatki from any local catholic church. 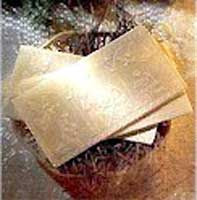 Oplatki are pieces of bread, about the size of a greeting card, compressed with religious scenes for the holiday season. The taste EXACTLY the same as communion. You can break them up, place em in a bowl, and even dip them in vegan cheese. That way, the communion won't serve the same purpose of a Tostido. seriously though, monday was a really good show. Bloggers from throughout northeast ohio and residents of the valley from both the city and suburb can learn a lot about the pertinent local issues by listening to this recording. I enjoyed your most recent post. I am a member of the generation that saw downtown Youngstown in its prime. My memories include lunches at the Italian restaurant and the Chinese restaurant (located on the same block) between classes at YSU. I enjoyed the sales at Strouss and Lustigs which enabled me to dress well for the school year as I took my first teaching job. And as a young adult, I took a bus downtown from the west side of Youngstown, accompanied by my mother and young son, to purchase furniture from Habers for my new home. I'm proud to say that my husband and I continue to support the restaurants and venues in the downtown area. We've enjoyed many performances at the Oakland and Powers followed by meals at Tomasinos, Barleys, and Cedars, to name a few of our favorites. I hope I will live to see the day when I can again purchase clothing and furniture from a downtown merchant. In the meantime, I will continue to let people know that there are good things to be found in the city and will glory in the knowledge that young people are discovering that. this is such an awesome post. i love the enthusiasm. i love alexandra736's comments. so poignant. she represents the generation that i would love to see come back to downtown. i also love marinelli's ideas...especially ipod dj nights. and the chevy center tix with local businesses. ah, this city has so much good in it. also, thumbs up to the obletki or however you spell it. christmas treat! is the grass greener in glasgow?